Peter Brown, a meteor physicist at Western University, tweeted that the event was captured by the university's meteor cameras last night. He told CBC News that meteors this bright are only spotted in eastern North America about once a year. He estimates the object that caused it was likely between the size of a basketball and a shopping cart. The fact that many people heard sonic booms suggest that it was a high-energy object that penetrated fairly deep into the atmosphere. Some videos show the object fragmenting into smaller pieces that appear to slow down. Together, those are all signs that it may have produced meteorites — fragments that could have made it to the ground. 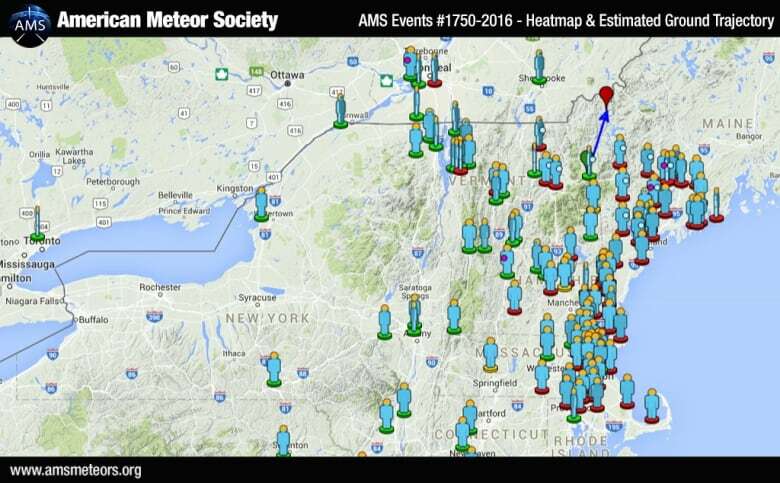 The meteor likely entered the Earth's atmosphere over eastern New Hampshire and travelled northeast, ending its fall in northwestern Maine, southeast of Sherbrooke, Que., the American Meteor Society estimates. A fragment that heavy would be about the size of a softball, Brown estimates. "I would not be surprised if meteorites of that size or larger are found," he said, adding that there are likely many fragments on the ground. However, they may not be easy to find, given that they appear to have fallen in a heavily forested area. "From a science standpoint, if anyone can recover even milligrams of material, we can do pretty much all the analysis that would tell us what kind of object it is," Brown said. What makes this object special is that scientists have enough data about it from their cameras to calculate its orbit and therefore where it came from — something that is known for only about 25 meteorites on Earth. "If people do recover this," Brown said, "it would be like a free sample return mission to an asteroid." A previous version of this story said the meteor likely entered the Earth's atmosphere over eastern New Hampshire and travelled northwest, when in fact it was travelling northeast.